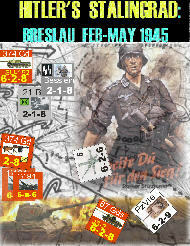 The German garrison within the city of Breslau defied all odds. After being cut off in mid-February, the garrison held onto the city until AFTER the war had ended! The task of taking the city had been given to the Russian 6th Army with eight divisions, four armor regiments and two artillery divisions. The task itself was daunting: urban warfare and a very determined defender. 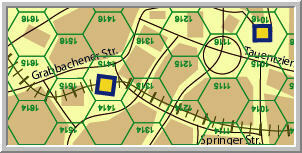 Since 6th Army also had to use some of its force to garrison the surrounding suburbs, in reality, the task really fell upon the 74th Corps and 3-4 tank brigades. The 2nd Air Army was to provide ample destructive power. The German garrison had 50,000 men (30,000 were Volksturm). The main focus of the Russian attacks fell upon the western part of the city to avoid the Oder River, which sliced up the city in many parts. The Russian 6th Army contained 80,000 + men, excluding the tanks regiments and artillery divisions assigned to lay siege to the city. Noted author, Col. David Glantz, provided the Order of Battle. Game scale: Weekly turns (9 in all), mostly companies\battalions for the German, mostly regiments for the Russian. Each hex is around 400 yds. The game is operational in nature spiced up with tactical nuances. A very different type game system. Larry Brasington 10 9 10 Nice board game. Wish there were more like it. A good simulation of the battle. Paul Kantro 9 8 9 An interesting game in an urban environment under unusual conditions. Inclusion of the "goliath" was a nice touch. Walter Stanfill 7 7 8 I think this is one of Perry's best games I have played so far.